Nauta Design took care of interior design and managed to create spaces which abound with huge amounts of light and space. The entire interior is designed in order to support sustainable development efforts of Lagoon catamarans so interior fitting is made of Alpi® reconstructed wood material. The hardtop deck is designed in a manner to provide three living spaces: the lounge, the sunbathing deck and the helm with skipper’s area where all commands for trimming the sails and navigation are placed. The foredeck cockpit provides an extra lounge space for lazy moments under sails or at the anchor. The cockpit under the fly-bridge is designed like a true terrace accessible from both aft cabins. There is also a dining table big enough for eight, along with a long sitting area connecting hulls at the aft. A folding platform placed between hulls, under the sitting area, usually used to carry the tender, could be lowered and used as a sea-surface cocktail bar! The saloon is also designed as the ensemble of three spaces of different purposes. The central position of the bow is reserved for skipper’s navigation and electric equipment which is retractable into a dashboard. The galley is placed to port, separated from the rest of the space by the storage console with the working area on top. Spacious and elegant dining table with a lot of sitting areas is placed to the starboard. All cabins are designed with regard to space and light. Master bedroom or the owner’s suite is placed aft to starboard and has a desk, independent bathroom and the private, direct access to the cockpit. Aft to port is where the VIP cabin is placed, also with the private access to the cockpit. Forward guest cabins also have desks and considerable storage space along with private bathrooms. Forward to starboard hides another VIP cabin while the gangway to port leads to the owner’s suite second access. The forward cockpit is where the access to large storage lockers, generator and electric systems is placed. This yacht is 56 feet long over all, with a 31 feet beam and a draft not more than 4 feet 11 inches (1.5 m). Lagoon 560 is delivered in several versions, the owner’s and 5 cabin version; and as Essential, Cruising and Comfort, depending on the owner’s taste or purpose. Considerable sailing area, easy-to-handle trimming and navigation systems along with huge water and fuel tanks guarantee fine sailing and maneuvering performances as well as the high-level reliability. 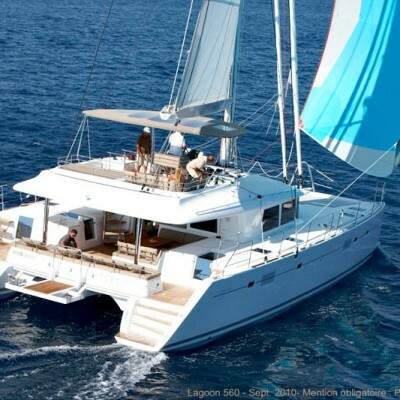 Sailing Lagoon 560 is really something to remember. Find out more about catamarans and where you can charter one for an unforgettable sailing experience on Sailing Catamaran Yachts.